The Prancing Horse’s new Special Series model, the 488 Pista Spider, has been unveiled at the Concours d’Elegance at Pebble Beach. 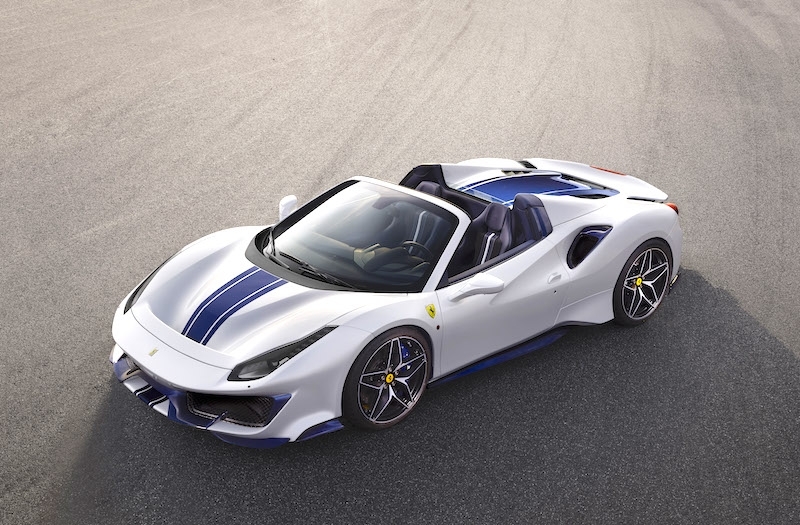 The 488 Pista Spider is Ferrari’s 50th drop-top model and a US premiere was a natural choice for the brand as, since the 1950s, the North American market is the biggest consumer of high-performance convertibles. 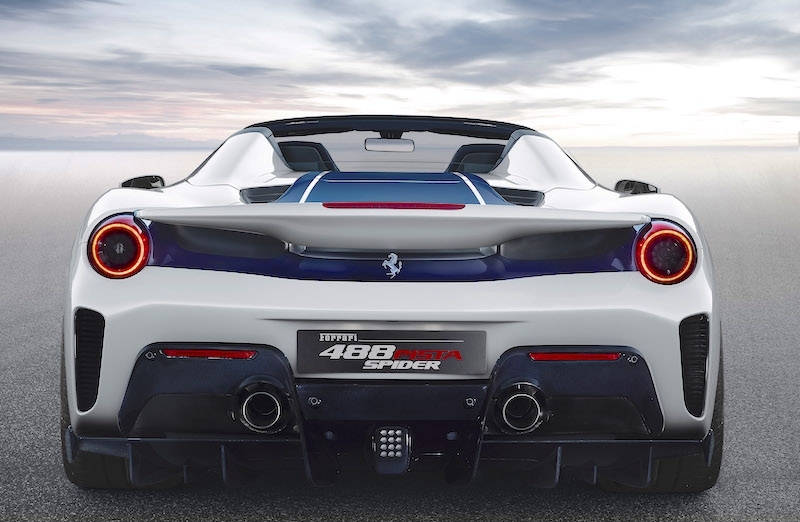 The 488 Pista Spider sets a new benchmark for Ferrari, for spider performance, made possible thanks to the adoption of the most powerful Ferrari V8 engine ever which was recently named Best Engine in the World for the third consecutive year at the 2018 International Engine of the Year awards. The 3,902 cc twin-turbo V8 unleashes 710 bhp @ 8,000 rpm/770 Nm @ 3,000 rpm and combines that power with increasing torque at all engine speeds for continuous and unending acceleration all the way to the redline. Standstill to 100 km/h takes 2.85 seconds, while 0-200 km/h needs only 8 seconds; maximum speed is rated at 340 km/h. 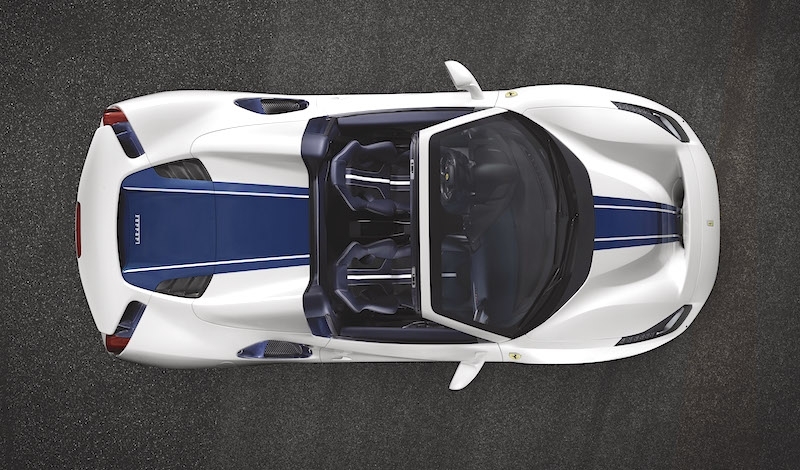 In terms of engineering, the 488 Pista Spider is directly derived from the 488 Pista which gets all the knowledge gathered from the world’s circuits through the 488 Challenge, and the 488 GTE. 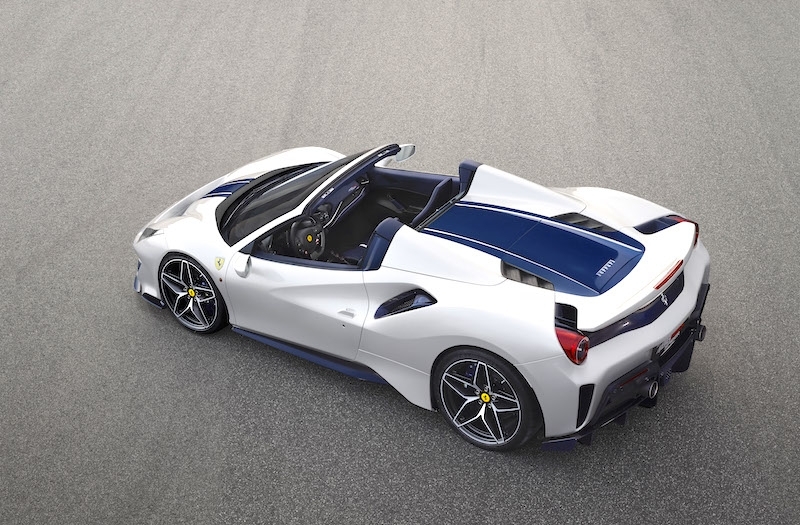 As a result, the new Spider offers the highest level yet of technological transfer from the track to a road-legal drop-top. At the same time, a characteristic central livery runs the whole length of the car, expanding towards the rear where it finishes at the end of the rear wing just before the spoiler; this mimics the movement of airflow, exalting the lines of the car. 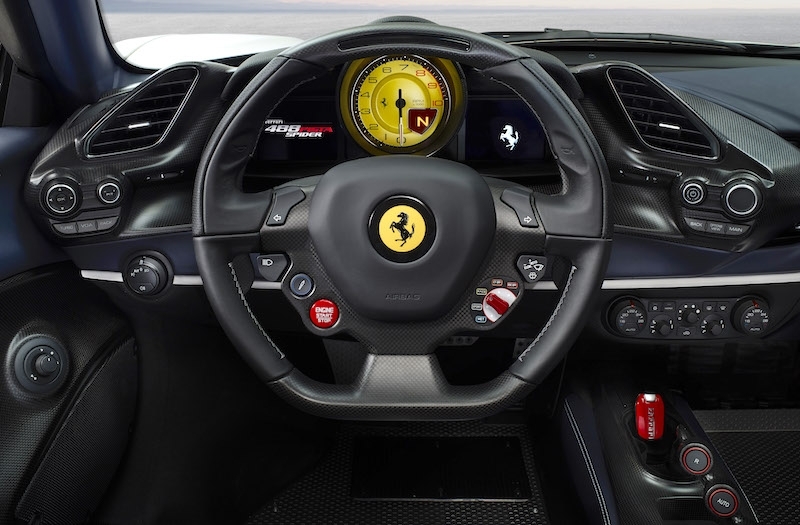 Driver can expect razor-sharp acceleration, braking efficiency, lightning-fast gear shifting, precise steering, grip, stability and superb handling all in one package here all thanks to the new lateral dynamics control system, the Ferrari Dynamic Enhancer (FDE). 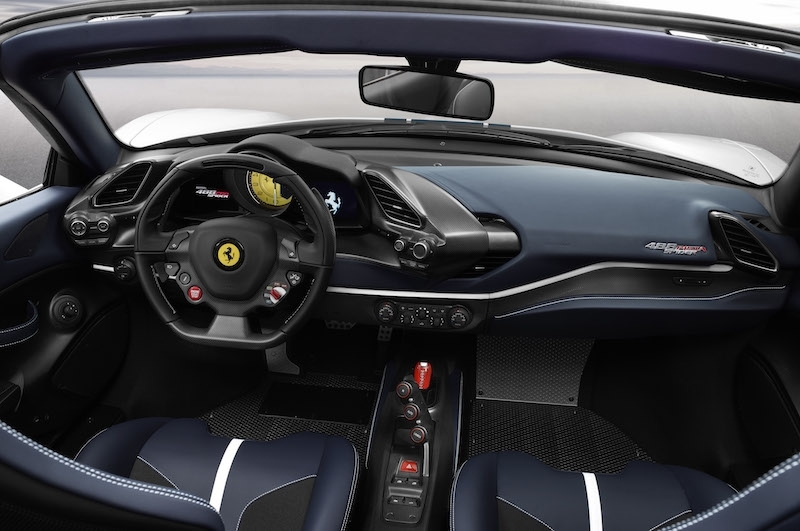 Inside, Ferrari offers a generous use of carbon-fibre and Alcantara throughout, with the carpets replaced by patterned aluminium foot plates and the driver’s side door handle now a simple strap; all in the name of weight saving. 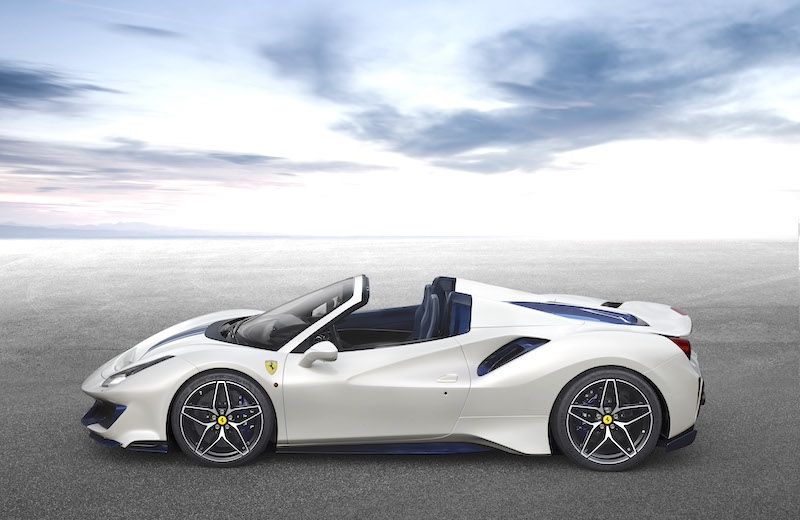 The 488 Pista Spider features new diamond-finish 20-inch alloy wheels with a 10-spoke star-effect interpretation of Ferrari’s traditional mid-rear engine Berlinetta-style rims. Also available are optional one-piece carbon-fibre wheels, which offer a 20-percent weight reduction over the standard forged alloys.